A health care company’s decision to close a Phoenix facility where an incapacitated woman was raped and later gave birth drew criticism Feb. 8 from state officials. The closure would force numerous patients to be relocated to a new facility. 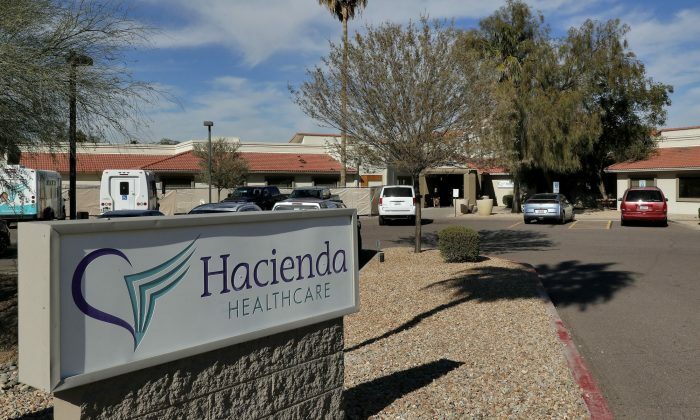 State regulators said Hacienda HealthCare’s announcement that it would shut its intermediate care facility contractually requires written consent from the state Department of Economic Security. The letter, signed by the directors of the state’s Medicaid program and the Department of Economic Security, gave Hacienda’s board of directors until 4 p.m. local time on Friday to answer questions about the closure decision. Capriotti said it’s not clear what the state will do if officials fail to meet the deadline. In the meantime, the state is working on contingency plans if the closure goes through. Capriotti declined to discuss details. A skilled nursing facility that shares the campus will remain open. The state, however, renewed its calls for Hacienda to settle on an outside management team. Their only other option, officials said, would be to agree to allow the state Department of Health Services to hold licensing authority over the facility. Hacienda operates the only privately-run intermediate care facility in Arizona. It currently serves 37 intellectually disabled children and adults, some of whom are considered “medically fragile.” Hacienda officials say it would take weeks or months to transition all of them to other places. Will Humble, a former director of the Department of Health Services, said there is no “one size fits all” solution for relocating everyone. “One of the things to remember is that each individual person has individual needs,” Humble said. While some may require an intermediate care facility, others could qualify for placement in a community residential setting, depending on their medical and behavioral needs. Despite Hacienda’s declaration, Humble thinks there is still a chance the closure might not happen. The male nurse who allegedly raped and impregnated an incapacitated woman was indicted on Jan. 29 on charges of sexual assault and abuse of a vulnerable adult. A grand jury indicted Nathan Sutherland following his Jan. 23 arrest, one month after the woman gave birth to a baby boy at a Hacienda HealthCare facility in Phoenix, Arizona, reported 12 News. Sutherland is scheduled to be arraigned on Feb. 5 at 8:30 a.m.
Workers at Hacienda said they were not aware that the woman, who was initially reported to be in a vegetative state but was clarified to be incapacitated, was pregnant until she started delivering the baby. A frantic 911 call ensued but the baby was born healthy. Phoenix police officials said that Sutherland’s DNA matched that of the woman and baby. The DNA was obtained as part of the investigation; police got samples from all male employees. Phoenix Police Chief Jeri Williams said at a press conference following the arrest that Sutherland, 36, was a licensed nurse who had worked at the facility since 2011. The investigation includes trying to figure out whether Sutherland assaulted any other people inside the facility, according to Phoenix police Sgt. Tommy Thompson.